This is a simple and compact case for the Raspberry Pi Zero. There is enough space below the Pi Zero to use its solder pads if you want to, for example to use the pads for power and USB data. I prepared multiple versions of this case that only differ in the number of accessible ports. Every version has cutouts for the HDMI and both Micro USB sockets. Additionally there are versions with cutouts for the GPIO pins, the Micro SD socket and the camera cable. Have a look at All variants later on this page to see which combinations of the bottom case and lid versions are reasonable. Furthermore each bottom case version comes in a second variant with more cutouts on the big bottom surface to save some filament and as venting holes. A similar alternative casing for the Raspberry Pi Zero would be Case for Raspberry Pi Zero with integrated mini camera. Use it just as a case for your Raspberry Pi Zero ;-) Even though the Pi Zero is rather robust and I haven't yet managed to destroy one, it feels better to have it in a casing. 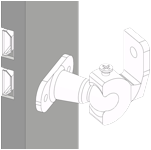 Use the Hinge mount or Ball and socket mount as flexible wall mount for this case. While designing my parts I always try to optimize their design and orientation in a way that they are as robus as possible but won't need support structures while 3d printing them. Of course you can rotate the parts around the Z-axis prior to printing, but please don't do so on the X/Y-axis. A layer height of 0.2mm or 0.3mm is optimal. Because of the small size I print them all at 100% infill. 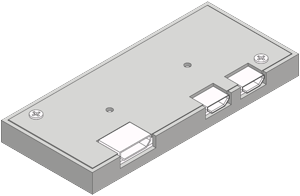 If the printing was precise enough the lid may even be able to stay closed without the screws. The maximal version of this case. In addition to the default HDMI and both Micro USB cutouts, there are cutouts for Micro SD, GPIO pins and the camera cable. Bottom case, with venting and filament saving cutouts. The minimal version of this case. Only the default HDMI and both Micro USB ports are accessible once the case is closed. In this truth table you can see the different variants and their reasonable combination possibilities. The top row shows the lid variants, the left column the bottom case variants.